I'm trying to play this scenario as the Axis, but cannot get any armored units under the overpass that must be negotiated to get into the field of play. Every time one of these units passes under the bridge it gets teleported to the railway above, from which there is no path back to the rest of the map. I've tried setting waypoints several different ways, but haven't found a trick that works yet. Any thoughts on how I can make this work? Yeah, there seems to be a perennial problem with bridges, and diagonal seem the worst offenders. Needless to say, it *is* possible to get the vehicles through there (and the mp is set up such that you can't drive over the rail embankment. I suggest that you don't put a waypoint under the bridge, and set the movement path under the bridge so that it is as straight and central as possible (so the vehicle doesn't have to reassess its movement while under there. Thanks much for your note. 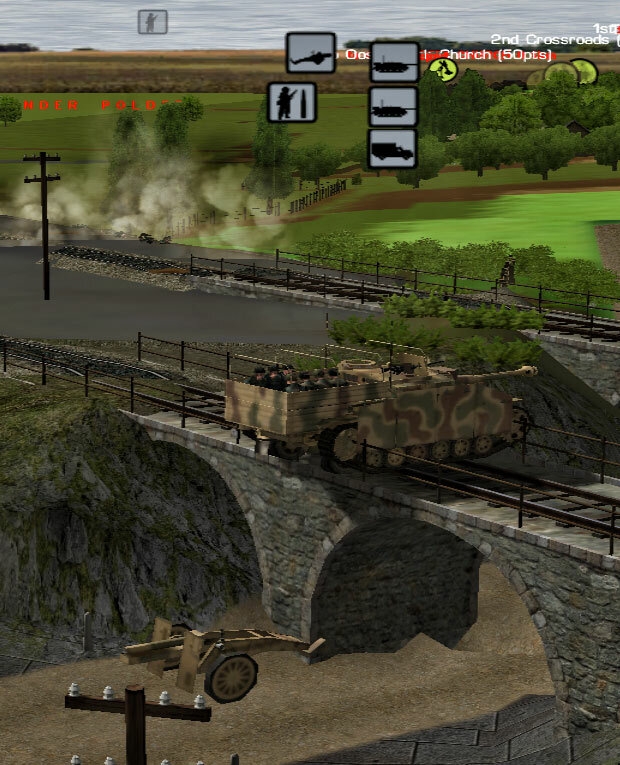 Unfortunately, no matter how I draw the movement path the tanks (and following halftracks) always end up on top of the bridge. Really disappointing, as it looks like a very interesting scenario. Tom, I just tried it, and it worked for me. The orders I gave are in the attached pic. I used SLOW. Jon, I sincerely appreciate your help on this matter. But for some reason I'm still not able to get my tanks through that bridge, even when trying to trace the exact path you've laid out (and going slow). I just ran through it three times, trying to stay to the exact middle of the road, and ended up with both tanks perched on the railway each time. What if you go into the editor, delete those railroad bridges and start the scenario over - you should be good to go. AFAIK they have been a problem since the scenario was released. Are you all up-to-date patch wise? Spoke to soon - while the first stug on set up moves okay underneath the bridges, I can confirm the later two reinforcement vehicles both get identically & permanently stuck. Hope I can dismount the gun from the levitated truck and get into action. It seems that when one gets stuck, all the subsequent vehicles will too. @rocketman makes a good suggestion: go into the editor and delete the bridges. Their only function is aesthetic. Looking at @Wickys screen shots - it looks like the foundation of the bridge is on the road tile. Could it be that the game engine confuses bridge for road as the vehicle crosses the intersection? Can you tell at what moment the tank teleports? Meantime, as suggested upstream, the best (fastest?) solution would be to open the battle in the editor and delete the offending bridges. Edited to add: Okay, gents, I've tried, but I cannot get my machine to replicate the issue. I've reduced the map to the problem zone (~ 800m x 640m), and made all the reinforcements come in at 5 minutes (so I don't have to spend all night pressing "Go"). Every time, all the StuGs, all the StuHs and all the Opels dragging guns made it through. I tried short, choppy movement orders. I tried it as just one long one. I went Fast, I went slow. Repeated attempts, all for naught. Anyone have a saved game of the command phase and one of the replay phase? @c3k I've replicated it, but no save (I got the three StuGs through, but everything after that got stuck). I'll go again tonight and add a save file to your report. @rocketman fair question, however with the way the editor is structured (ie, the size of roads, size of tiles, and placement of bridge foundations) there is no way to avoid it, especially on diagonal roads. I replayed it and caught it happening with one of the pair of Stug reinforcements. Thanks for the help, everyone. Per the suggestions, I removed the bridge from the scenario map and now everything works perfectly.